HI! It’s Dee Krupnick RDN again. Us Nutritionists/Dietitians need some fun in the kitchen and no better way than to make a chocolate treat ! So I thought I would” throw” together some chocolate truffles all made in a mixing bowl- yes this is quick recipe with high cacoa 70% to 80% chocolate (bittersweet), unsweetened or sweetened shredded coconut, a little coconut oil, ground almonds and sweetener (your preference ). This recipe is adapted from several recipes and made lower in fat and sugar. Mix together all the ingredients except the chocolate in a mixing bowl and roll into truffle balls and place on a parchment covered cookie sheet and place in the refrigerator for 30 minutes. On low heat, melt chopped chocolate in a bowl over simmering water for 4 minutes. Take chocolate off the heat to cool for 5 minutes. 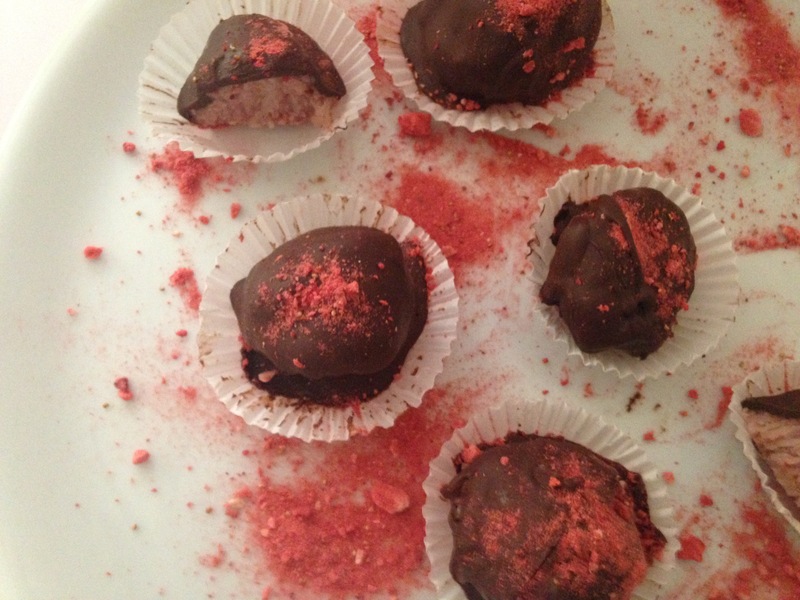 Take truffles out of the refrigerator and dip into the room temperature chocolate . Cool on the cookie sheet pan lined with parchment paper and place in the refrigerator for 1 hour.